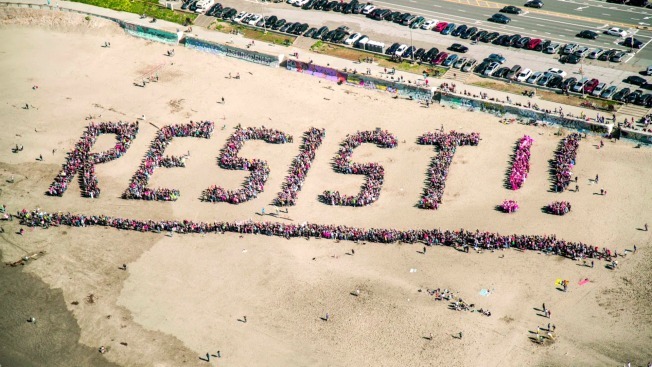 Protesters took to Ocean Beach on Saturday with a new spin on their resistance to President Donald Trump. Brad Newsham, the organizer of the event, said that roughly 5,000 people gathered to help spell “Resist! !” on the sand. Their message was underlined – with yet another human chain. Pictures from the scene showed that the word had been marked in the sand before the crowd arrived. The upbeat protest included chants of "We want a leader, not a creepy tweeter!" and a slew of signs – one of which read “Fight Fascism in USA.” One of the exclamation points was created by people clad in neon pink, who one Twitter user said belonged to the grassroots organization Codepink. A helicopter reportedly flew overhead and took photos of the protest, immortalizing the moment.